No Money? No Insurance? No Problem! How to quickly find a good rehab center in your local area that you can afford. Rich or Poor - You Can Get Into Rehab! Find a free or low-cost rehab near you! More than 1,500 free rehabs across the country to choose from! Learn how to get state-funded rehab! Find out how to get what you deserve from your insurance company! Find out how you can get credit for rehab! Learn how to pick a great rehab on any budget, and how to avoid low quality! Do you even need rehab? Learn what you really need to get better! Learn how you can get a loved one into rehab. You can get them sober! Learn exactly what family can do to help before, during and after rehab! No relapse - learn how to stay clean and sober after rehab! When you've got good insurance, everyone wants to help you, when you don’t - no one seems to care - and when you search for affordable options, you find nothing! It can feel hopeless. 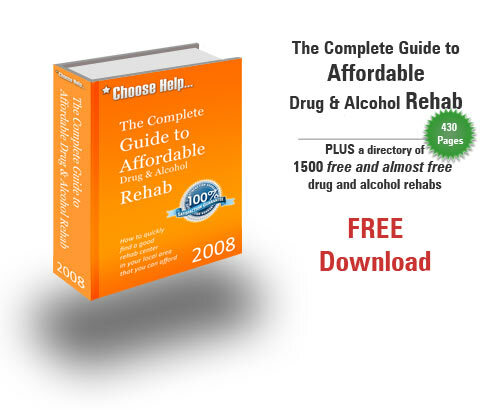 Well, let me tell you that finding an affordable or even free rehab center is NOT impossible. But, my oh my -- it is hard! We spent weeks researching free and almost free drug and alcohol rehabs; and we had a really tough time finding them among a mountain of expensive rehab offerings. We spent every day all day with phone calls, emails and searching the internet before we finally ended up with an extensive list of quality low-cost or even free rehab centers. In the end, those weeks of full-time research paid off and we started creating a directory of over 1,500 rehab centers that are available to you for little or no money. See, free and low-cost rehabs don’t have the money to compete with the marketing efforts of expensive private centers. They may have a web page, but when it’s buried by tens of thousands of commercial rehab sites, you will never find it. Nobody Cares About You When You Don’t Have Insurance! Try calling any of the hundreds of 1-800 "help"-lines splashed across the internet, numbers that promise answers and promise to help. Tell them you have no money to pay for rehab and see how many answers you get. Tell them you have no insurance and listen to phony concern fade from the voice of an operator that can’t wait to get you off the phone. So Many People Just Give Up... Don’t Give Up!!! It’s tragic too, so many people that just want and deserve a little help to live a better life never find what they need, never learn about a local no-cost option and just get so fed up with the whole process that they give up. How many tens of thousands every week give up on a dream of a better life, convinced that there is no one that will help them, nowhere they can turn? Find a Rehab That Cares About You... Not your Money! Well there are places, there are thousands of them. Places where they don’t care about your money, they care about you. Places where you’re going to get the help you need, you’re going to get treated well and where you’re going to learn what you need to know to get better... and stay better! How can I find a rehab that I can afford? Just check the list of free or almost free rehabs in your state. Find web site urls, phone numbers and general information for more than 1,500 rehabs across the country. Will the state help me? Learn how to claim free drug treatment from the state, even if you can’t get Medicare! Learn what you need to ask and learn the phone number of the person in charge of drug treatment in your state. Don’t waste your time fighting through bureaucracy, we did it for you! What if I want private rehab, can I get credit? Even with a bad credit rating, there are people who will give you money for medical care that you need. Find out how to claim it. How can I get more out of my insurance company? You may be entitled to more than you think you are. Find out how to check. How can I know if a rehab is any good? Learn 10 easy ways to spot a good rehab, and avoid the bad ones. Do I even need rehab? Before you waste your money on treatment you might not need, find out if you’re an addict or an abuser, learn about different treatment options and learn what type of treatment you really need, not what kind of treatment makes someone else the most money. Why can’t I stop on my own? Learn why willpower has nothing to do with it, and learn how rehab can teach you what you need to know to get better. How can I get a loved one to stop? Learn about interventions, and learn why they work 90% of the time to get someone into treatment. Learn how you can run an intervention that’s going to work. Don’t I have to wait for them to want to get help? Learn why you should never wait for rock bottom, and learn why getting them into treatment is going to work. How can I help them stay sober? Learn how your support during and after rehab can make the difference. You can keep them sober. What about rehab for teens, seniors, gays and lesbians and psychiatric patients? Learn what’s really needed for people with special needs, and learn how to find a low-cost rehab that’s going to get them sober, whatever their situation. It doesn’t matter who you are, where you live or how old you may be…you can get into rehab, and if you don’t have any money, you can get into free rehab. Get Educated, Get Empowered…Get Better! You’re feeling stressed out. Worried about making a mistake, worried about not getting the help you need, and worried about committing to a month or more of treatment that may or may not be what you need to get better. Maybe you don’t need rehab? Learn what your outpatient options are and learn who can get better with outpatient, and who needs rehab! Learn guaranteed ways to stay sober after rehab! Find out about the special treatment needs of teens, pregnant women, gays and lesbians and seniors! Learn how you can judge the quality of a rehab …on the phone! Learn who will help you and who won’t and save your precious time and energy! How can you trust someone who wants to sell you an expensive rehab? How can you know who has your best interests at heart, and who only lusts after your money? You can’t! That’s why you need to get educated, don’t rely on someone else to tell you what to do…find out for yourself what you need to do!